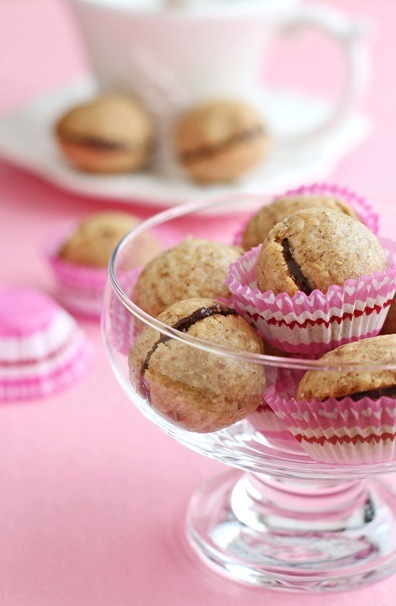 Baci di Dama (literally, Lady's Kisses) are delicious, so small, elegant and fragrant. But they're as seductive as deceiving. Flattening in the oven is their specialty, no matter how nice and neat, round and perfect they look on the baking sheet. What a fool you are! You've even measured them with a fruit scoop in order to have them all the same size, you thought you'd given them an impeccable shape, handling them with love between your hands while focusing on the perfect roundness of the sun, a Christmas ornament or a cherry. And their fragrance! Even that is mean. A strong hazelnut scent spreads throughout the house, it doesn't let you foresee anything, even your neighbors are alerting their senses. Yes, it's that good. I think it's really time to open the oven. AHHHHHHHHHHHHHHHHHHHHHHHHHHHHHHHHHHHHHHHHH! You scream out of despair, you tear your hair out, you look incredulous. That's it...I quit....Yes, tomorrow the girl is shutting down her kitchen and she's going to be an hermit in Alaska, for a new blog-free decade. The Lady's Kiss, the same one you devoted your last culinary afternoon of 2009, has become a whole shapeless layer, a giant hazelnut-tasting platform that along with the cookie has smashed away all your hunger for fame. And now what am I supposed to do with this huge Kiss and all that Nutella-like Spread? A large chocolate-covered pizza, flat and hazelnutty? An almond flying saucer? A New-Age sbrisolona (Italian flat, crumbly cake, made with almonds)? No, Alaska seems to be the best option. New year, new life. But luckily, as expected, even this year all your great resolutions vanish quickly, this time already at January first dawn. New year, same old routine. Do stretching exercises, make less cookies, be on time, don't swear, go to bed early, do yoga, drink a half gallon of water every day: who do you think you are? To me, nothing has changed: today I missed my yoga class in order to make the Lady's Kisses one more time, I shouted unrepeatable words against the oven so that it wouldn't dare playing tricks on me, I missed the bus and for sure I'll go to sleep at 4am to publish this post, I arrived late at a dinner with a friend 'cause I had to photograph the little evils before giving them as a gift, I've drunk the usual bottomless cup of coffee at Starbucks and half a sip of water the whole day, and I gave up on Alaska. It's too cold anyways. So may this 2010 be a year full of the usual things, all the ones that make your day rosy, the scent of hazelnuts roasting in the oven, a phone call from a friend, a song by the Beatles, a slice of bread with jam, a Sunday afternoon at the movies, a trip to the countryside, fresh snow, end-of-season sales, the kisses from your elegant ladies or your sweet-smelling gentlemen, depending on your taste. Amen. Toast almonds and hazelnuts in the oven. Let them cool off, then try to eliminate their outer skin as much as possible. Grind them finely in the mixer with a little bit of sugar (taken from the whole amount), to prevent them releasing the oil. Mix sugar and cold butter, then add flour, ground almond-hazelnut mixture, egg yolk and salt, and work the dough quickly until it's smooth. Shape it into a ball, cover with plastic and let it rest in the fridge for few hours or overnight (it keeps well even for few days). After this time, take the dough out of the fridge and form small balls approximately the size of a cherry. Place them slightly apart on a baking sheet covered with parchment paper. To avoid the Lady's Kisses flattening disaster when baking them, after you've shaped the balls, let them rest in the fridge for about half hour, so that they're very cold by the time you put them in the oven. Bake at medium-low temperature (220-260F) for about 20 or 30 minutes. The temperature and the baking time vary depending on the oven. It's better to keep a medium-low heat (to avoid the flattening disaster) and keep watching them every ten minutes. They're ready when their surface starts breaking. As soon as they come out of the oven, they're very delicate and crumbly; therefore it's better to let them cool completely on the baking sheet before handling. For the filling, melt some dark chocolate and use it to attach two half-cookies together. I've used the Nutella-like spread made with dark chocolate (OK, yes, I posted the one with milk chocolate, but the truth is, I made two versions, so now I have 4 jars of chocolate spread...!!). Short parenthesis: Lady's Kisses can be also made with hazelnuts only or almonds only, or you can add some cocoa powder to the dough and fill them with white chocolate instead. The main ingredients - butter, nuts, flour and sugar - should be used in the same weight amount; I've used less sugar because I like them better less sweet. Water has been a part of my life from the get go. I been a swimmer! As a family, now, teaching the importance of these key messages that can help generation to generation, to be able to experience the world like we been able to. We been very fortunate to always have access to running water. He was reportedly getting his life back together after his parole in 2006 Sac Longchamp Solde following Ray Ban Sunglasses Sale UK more Longchamp Soldes Destockage than two decades in state prison for a murder committed during a robbery. Oakley Sunglasses Sale UK In April his family Michael Kors Purses Clearance hired Michael Baden, an independent pathologist, to independently examine Byrd's police, medical and autopsy records. Baden is known for his work on numerous high profile cases, including the reinvestigation of the John F.
Reset the SSIDReset your router to factory settings and use the default name on the sticker if you still can figure out your SSID. Look for a small Reset or Restore Factory Settings button on the router often, the button is protected inside a hole and you need a pin or toothpick to press it. Press and hold the button until Bolsos Michael Kors Baratos your router reboots to reset the SSID.